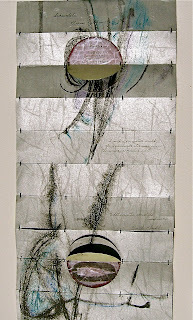 Clarissa Jakobsons' Poetry Book Art: Integration of Line, Materials, Design. Graphite, ink, linen, crystal, colored pencils, hand-made paper, poetic vision and artistic talent―these are the ingredients of Clarissa Jakobsons' poetry art books. 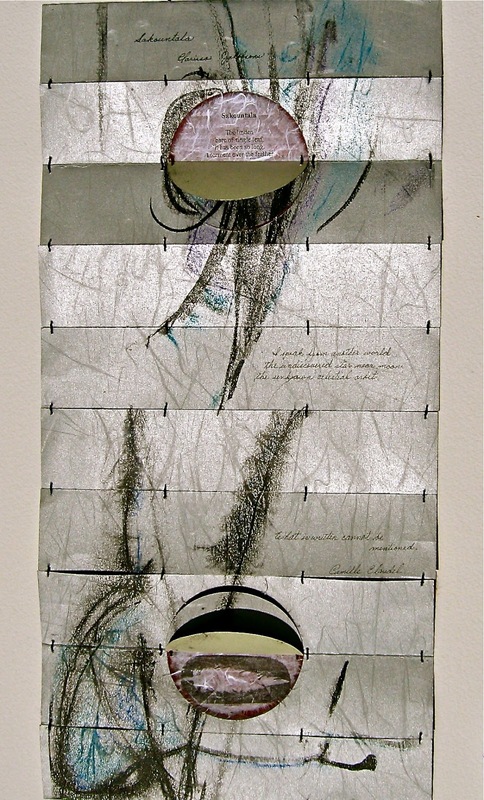 Clarissa integrates words, color, texture and design to create poetry art that represents a reflective surface of materials that mirror the poems' sense, tone, structure. Her poems become made things in the world by virtue of the paper, ink, thread in which they become more fully enacted - a natural ekphrastacy. I first met Clarissa Jakobsons in 2005 at a reading and reception for the Akron Art Museum sponsored New Words Poetry Contest, where her poem was awarded first place. She dressed in the character of the poem's speaker and delivered an unforgettable dramatic reading that raised the lines to life. I was delighted to encounter her again at the Cleveland Poetry Salon three years later, and, happily, the paths of our writing lives have crossed and re-crossed through the years since. The history of the poetry art book dates back to the ancients, no doubt, with papyrus serving as the primary material resource. The contemporary handmade poetry art book is exemplified by Blake's Songs of Innocence and Experience, which he wrote, illustrated, printed and bound, as well as hand-painted the cover. Inspired by endeavors such as Blake's, modern poetry art book forms are endlessly varied and fabulously imaginative: fold-outs, concertinas, shape books, scrolls; the list goes on and on. In a recent exhibit of Clarissa's art books, a wonderful array of book forms and resources, complementing the poems within, provided a powerful visual and literary feast. Clarissa's creative life is multifaceted, and her work is imbued with the kind of sensory immersion displayed at that reading where we met; she paints, creates book art, writes poetry, all with a signature flair. For the purpose of this article, I will narrow the discussion to just two of Clarissa's paper/poetry art pieces: the handmade book, My Lithuania, Land of Myth, Amber and Hope, constructed of waxed linen cord, stab binding, image transfers, graphite, India ink, color pencil and a variety of handmade papers. The second art poetry piece we'll look at is the poem, "Sakountala ," a persona poem in the voice of Camille Claudel. The media for this poem include a palm leaf style binding, mixed media, hand-image transfers, crocheted cotton embroidery thread and a handmade box. Sakountala is a long, vertical paper and exhibited as a suspended piece that turns slightly this way and that, in animated movement, in a gallery setting. I chose these two book art pieces because they embody the poet's obsessions: the rich culture and landscape of her native land, Lithuania, and the brilliant and tragic life of the 19th century French sculptor, Camille Claudel. The six poems in My Lithuania read as a linked homage to the poet's ancestry. A tone of reverence, wonder and discovery resonates throughout the collection. The book opens with a golden glow: "Baltic Amber, Ginataras." Amber serves as the symbol of life, of health, vitality and, as the poet alludes in the book's title, hope. The poet also celebrates that preservative power of amber in the opening stanza of this poem: "Bee stung, buried under pine/sap resin, her hand lifts three-/dimensional animal spirits/into transparent legends." The "she" in the poem is Zvaigzde, Queen of Stars. Indeed, these poems are populated by Gods and Goddesses of Baltic myth and legend. Their presence imparts a mystique, a spiritual depth, and their exotic names lend an added musicality to the poems. below the crescent moon. So may it be. Clarissa's art book, Sakountala, is her second artist book in a trilogy dedicated to the sculptor, Camille Claudel. The title poem references the embrace of a an Indian prince and the Indian maiden, Sakountala, to whom he kept the promise of his vows. For Camille, sadly, her mentor and lover, Rodin, abandoned her. An image transfer of Rodin's "The Thinker" is on the back of the piece, in literal and figurative opposition to the charged emotional content of the Camille poem. or I shall grow mad. and the poem continues down the stitched panels of hand-made paper. Stitched, bound and laid on hand-made paper, Clarissa Jakobsons' poems have earned their place in her beautifully designed and crafted art books. B: Your poetry and visual art are integrated so beautifully in your art books. I'd like to have a conversation that involves both your creative life as a poet and as an artist. To begin, I wonder if you can talk about the creative inception of an art book. When you have a poetic notion, does the drafting of that poem lead to you paper texture, color, material ornamentation, etc.? Does the muse usually guide you down the parallel paths of text and materials? C: I delve into personal imagery, sometimes meditating in the spontaneous moment. Each brush stroke, each color is a response, from flowing oils that dance on canvas to my artist books. My heart and soul are forever captured in the process of creating these pieces. I began as a visual artist dabbling in ceramics, weaving, drawing, printmaking, and photography. Everyday colors and forms entice me to experiment and analyze. At times a poem directs far more than laser print on white paper. I created For the Love of Bly specifically for the Hessler Street Fair by searching through my handmade paper collection for suitable covers that coordinated with insert papers and linen cord. The message of a poem may also direct color choices. At other times, paper takes precedent and I follow its dictates. A successful handmade book is the result of interrelated decisions about structure, technique, material, and poems at every stage of the process. B: The poems in your book art fit like hand-in-glove. What is typically your first inspiration, the art book or the poem it holds? C: I fluctuate depending upon the muse, or the event. As for the artist book, My Lithuania, Land of Myth, Amber, and Hope, I chose possible poems then created a small model of the proposed book deciding upon the best binding techniques while pondering over an avalanche of papers. I researched various ethnic monuments to assist with the visual representation of the poems, and to act as a travelogue. Solvent image transfers and color pencils add to the artistry. For the covers I chose a crinkled bronze paper, made in Thailand, meant to echo polished Baltic amber. B: When the first creation is the poem, what considerations determine what form or shape the book will take, what materials you'll use, etc? C: My first consideration would the length of the poem; sometimes a poem needs to fit the proposed page. Materials are based upon the binding technique. I delve into personal imagery, sometimes meditating in the spontaneous moment. B: What have been some of the more challenging materials you've worked with, and, along with that, what are the more difficult (and probably rewarding) pieces you have created? C: Each book, each technique presents unique challenges, whether working with transparent papers or gluing crinkled ones. For years, I’ve been experimenting altering books into various objects of art with crystals. The cover of My Lithuania, Land of Myth, Amber, and Hope was a challenge. Meditation relaxes my fingers and heart to avoid errors, which could result in starting over from square one. This ritual works well for me. I am excited to share my work because so much of me went into each book. Not only in content, but paper choices, imagery, and binding selections, which develops from a vision. Boundaries are pushed to create something new and different. The words are there because they came from me. Pages are hand stitched by me. Every element represents the essence of my artistic viewpoint. I hope people stop to consider what it is, and realize it was created with a controlled freedom. I make choices. The books are short in length but I will be happy if they have a long lasting provocative effect upon the viewer. B: When did you begin creating the art book, and which book art artists or pieces have inspired and influenced your own work? C: A bug bit my curiosity almost ten years ago! What if I combined my art background with my poetry and created artist books? My daughter, Marielle, and I decided to take a bookmaking course at the Provincetown Fine Arts Work Center with Peter Madden, who is a phenomenal instructor and artist. I created over a dozen books from day into nightfall. Marielle also created a slipcover for her new musical CD. B: The Cleveland area seems very resource-rich when it comes to art books. Can you talk a little about the history of the art book in NE Ohio, and which resources you rely on to practice your art? C: Art BooksCleveland is a local organization which invites the community to appreciate a variety of hand-produced books. Bonne de Blas offered a workshop at Heights Arts in 2008, where we gathered to have fun creating books. Since ABC was born, I have exhibited yearly with them, and we have grown into Octavofest’s offering exhibits at the Cleveland Museum of Art Ingalls Library for the last five years. Other venues include: Notre Dame College, the Morgan Conservatory, Lorain Community College, Shaker Heights Library, etc. I have watched the artist book community grow from toddler into an October giant. It has been a privilege. B: Your one-woman exhibit at the Moos Gallery this past fall was fabulous. I was enthralled with the variety and uniqueness of your art books, as well as paintings, in the gallery. Your work has been exhibited widely, even internationally. What are some of the venues where your work has been on exhibit? C: I have exhibited in the above-mentioned shows, as well as at The Box Gallery, in Akron. The Bind-O-Rama 20th Anniversary edition chose to include my crystal book: One Hundred American Poems. The Denver Abcedarium Gallery chose to exhibit Camille Claudel in Bardo. Breath Braces a Tulip Leaf has been on tour with Akron University’s Monumental Ideas In Miniature Books III Exhibit, traveling to San Francisco and Spain. B: I'd like to talk about the poetry in these beautiful books. There are recurrent themes that could be called the poet's obsessions. I'm always intrigued by the power of certain objects to haunt us, such as Baltic amber, a direct link to your Lithuanian heritage. Could you talk about the significance of amber as more than just a beautiful stone? They buried Tutankhamen with a chest full of amber beads, the quantity of amber in the Royal Tomb of Qatna, Syria, is unparalleled. Amber was sent from the North to the temple of Apollo at Delphi as offerings. The Amber Road stretched into the Silk Road. Amber has been a cure all since Hippocrates, the father of medicine. Rubbing amber yields a pleasant aromatic scent and makes it negatively electrically charged, attracting hair and thin paper. The word electricity derives from the Greek, élektron. Amber comes in various colors such as butter, lemon, honey, green, cognac, cherry, and black cherry. I prefer the cognac variety. It is handed down for generations, all of my relatives revered amber for its holistic qualities. Picture yourself walking across Baltic sand dunes and picking your own perfect gem. But, take heed, synthetic amber floods the market. B: Other repeating themes connect your poetry, such as the oak tree, such as Camille Claudel. The Camille poems are often written as persona pieces. What about Camille's story stirs and inspires you? C: The first time I viewed the 1988 movie, Camille Claudel, she simmered in my subconscious only to resurface during my nine-week stay in Paris, 12 years ago. Strolling the Rodin Museum gardens and viewing her room of sculptures opened wounds resulting in years of research into her life of buried secrets. Her mother and brother forced her into public asylums wherein she died 30 years later. She was Auguste Rodin’s student, model, lover, and collaborator. I wonder which of his signed sculptures should carry Camille’s name? There is a common thread that weaves my work; perhaps it’s about women who were born in the wrong place and time—whether in Germany, during WW II or Camille Claudel during the 1800’s, in France. Perhaps I’ve been captivated by the perceived thoughts of other female artists and what motivated them to live their lives as they did. These are universal questions and I haven’t figured out all the answers but hope people share their thoughts with me. I am immersed in the creative process while recognizing the sisterhood and brotherhood of all artists, living and dead. After years of riding the tail of the comet muse, I have surrendered to her will. When she gives me words to describe my place in her cosmos, I will paint them on canvas or create one-of-a kind artist books! The emphasis is creativity, full of colorful observations, life experiences, and reflections. A world of possibilities opens doors. Please enter and linger; let us speculate together! B: What new projects are brewing in your proverbial garret? C: Currently I am playing with the idea of sewn silk flowers and Saunders papers from England. This idea will linger and grow. Other times, deadlines force prompt action filled with amber and meditations. Clarissa Jakobsons is an artist, poet, instructor, five-year associate editor of the Arsenic Lobster Poetry Journal. She was twice featured poet at The Shakespear and Co. Bookstore in Paris, and awarded first-place at the 2005 Akron Art Museum's New Words Poetry Competition. Sample publications include Glint Literary Journal, Hawaii Pacific Review, The Lake, Ruminate, Tower Magazine, Qarrtsiluni, The Yale Journal for the Humanities in Medicine and Van Gogh's Ear. 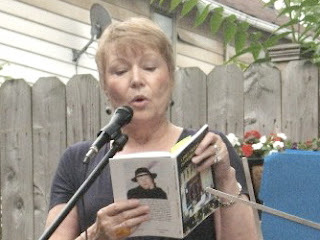 She conducted an ekphrastic poetry workshop at the Cleveland Museum of Art, sponsored by the Ohio Poetry Association. Her one-of-a-kind artist books are exhibited at museums and galleries regionally, nationally and in Europe.